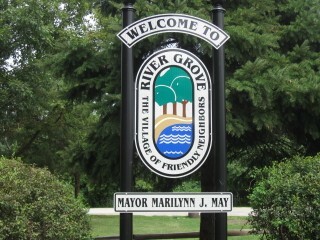 The Village of River Grove is located approximately 12 miles northwest of the Chicago "Loop" in suburban Cook county. According to the 2010 census the population was 10,227, with 4,404 households. The village has a total area of 2.4 square miles. The Village's municipal neighbors include Chicago to the north, Elmwood Park to the east, Melrose Park to the south, and Franklin Park to the west. Transportation links include 1st Avenue and Grand Avenue. Commuter train service to Chicago is available with a station in the village. O'Hare International Airport is approximately 5 miles from the Village.